Not to be confused with Ottoman Kosovo. 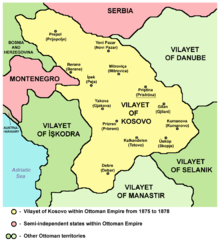 The Vilayet of Kosovo (Ottoman Turkish: ولايت قوصوه‎, Vilâyet-i Kosova; Turkish: Kosova Vilayeti; Albanian: Vilajeti i Kosovës; Macedonian: Косовски вилает, Kosovski vilaet; Serbian: Косовски вилајет, Kosovski vilajet) was a first-level administrative division (vilayet) of the Ottoman Empire in the Balkan Peninsula which included the current territory of Kosovo and the western part of the Republic of North Macedonia. The areas today comprising Sandžak (Raška) region of Serbia and Montenegro, although de jure under Ottoman control, were in fact under Austro- Hungarian occupation from 1878 until 1909, as provided under Article 25 of the Treaty of Berlin. Uskub (Skopje) functioned as the capital of the province and the mid way point between Istanbul and its European provinces. Uskub's population of 32,000 made it the largest city in the province, followed by Prizren, also numbering at 30,000. The Vilayet stood as a microcosm of Ottoman society; incorporated within its boundaries were diverse groups of peoples and religions: Albanians, Serbs, Bosniaks; Muslims and Christians, both Orthodox and Catholic. The province was renowned for its craftsmen and important cities such as İpek (today's Peć, Albanian: Peja), where distinct Ottoman architecture and public baths were erected, some of which can still be seen today. The birthplace of the Albanian national identity was first articulated in Prizren, by the League of Prizren members in 1878. As a result, firstly of the Treaty of San Stefano in 1878, then of the modified Treaty of Berlin the same year which split the Ottoman Empire, Kosovo became the first line of defense for the Ottoman Empire, with large garrisons of Ottoman troops being stationed in the province. Before the First Balkan War in 1912, the province's shape and location denied Serbia and Montenegro a common land border. After the war, the major part of the vilayet was divided between Montenegro and Serbia. These borders were all ratified at the Treaty of London in 1913. The Ottoman Empire finally recognised the new borders following a peace deal with the Kingdom of Serbia on 14 March 1914. Üsküp was the administrative capital of the vilayet and other important towns included Priştine (10,000 inhabitants), İpek, Mitroviçe and Prizren. Kosovo vilayet encompassed the Sandžak region cutting into present-day Central Serbia and Montenegro along with the Kukës municipality and surrounding region in present-day northern Albania. Between 1881 and 1912 (its final chapter), it was internally expanded to include other regions of present-day Republic of North acedonia, including larger urban settlements such as Štip (İştip), Kumanovo (Kumanova) and Kratovo (Kratova) (see map). The Vilayet of Kosovo was created in 1877, and consisted of a much larger area than modern Kosovo, as it also included the Sanjak of Novi Pazar, the Sanjak of Niş (until 1878), the region around Plav and Gusinje as well as the Dibra region. These regions had belonged to the former Eyalet of Niş, the Eyalet of Üsküb and, after 1865, the Danube Vilayet. In 1868 the Vilayet of Prizren was created with the sanjaks of Prizren, Dibra, Skopje and Nis, but it ceased to exist in 1877. During and after the Serbian–Ottoman War of 1876–78, between 30,000 and 70,000 Muslims, mostly Albanians, were expelled by the Serb army from the Sanjak of Niș and fled to the Kosovo Vilayet. In 1878, the League of Prizren was created by Albanians from four vilayets including the Vilayet of Kosovo. The League's purpose was to resist Ottoman rule and incursions by the newly emerging Balkan nations. The Kumanovo Uprising took place in early 1878 organized by an assembly of chiefs of the districts (Ottoman kaza) of Kumanovo, Kriva Palanka and Kratovo in the Vilayet of Kosovo (in modern-day northern Republic of North Macedonia) seeking to liberate the region from the hands of the Ottoman Empire and unify it with the Principality of Serbia, which was at war with the Ottomans at that time. With the Serbian Army's liberation of Niš (11 January 1878) and Vranje (31 January 1878), the rebellion had been activated during the latter event with guerrilla fighting. The rebels received secret aid from the Serbian government, though the uprising only lasted four months, until its suppression by the Ottomans. The province's boundaries shifted as the Ottoman Empire lost territory to neighboring states in the Treaty of Berlin following the Russo-Turkish War of 1877–1878 and parts were also internally transferred to Monastir Vilayet and from Salonica Vilayet. In 1879, western parts of the Sanjak of Novi Pazar, fell under Austro-Hungarian occupation in accord with the Berlin treaty which also allowed the Austro-Hungarian occupation of Bosnia and Herzegovina (remaining as such until 1908). Map of the Vilayet (1881–1913). Two major administrative changes happened in 1880 and 1902. In order to counter Austro-Hungarian military presence in western parts of the Sanjak of Novi Pazar, a new province was created in 1880: the Sanjak of Pljevlja (Taşlica) with kazas: Pljevlja, Prijepolje and Priboj. In 1902, kazas of Mitrovica and Novi Pazar were transferred to Sanjak of Pristina, and kazas of Berane and Rožaje to Sanjak of Ipek. In the same time, Sanjak of Sjenica (Seniçe) was created with kazas: Sjenica, Nova Varoš, Bijelo Polje and Lower Kolašin. In 1901, massacres of Serbs were carried out by Albanians in North Kosovo and Pristina. In 1910, an Albanian-organised insurrection broke out in Pristina and soon spread to the entire vilayet of Kosovo, lasting for three months. The Ottoman sultan visited Kosovo in June 1911 during peace settlement talks covering all Albanian-inhabited areas. Kosovo vilayet contained a diverse population of Muslim Albanians and Orthodox Serbs that was split along religious and ethnic lines. Muslim Albanians formed the majority of the population in Kosovo vilayet that included an important part of the urban-professional and landowning classes of major towns. Western Kosovo was composed of 50,000 inhabitants and an area dominated by the Albanian tribal system with 600 Albanians dying per year from blood feuding. The Yakova (Gjakovë) highlands contained 8 tribes that were mainly Muslim and in the Luma area near Prizren there were 5 tribes, mostly Muslim. The town of İpek had crypto-Christians who were of the Catholic faith. Similar to their counterparts in İşkodra Vilayet, Kosovar Malisors (highlanders) had privileges where by doing military service as irregular troops they paid no taxes and avoided military conscription. Ottoman rule among the highlanders was minimal to non-existent and government officials would ally themselves with local power holders to exert any form of authority. Kosovar Albanian Malisors settled disputes among themselves through their mountain law and Ottoman officials disapproved of the autonomy they exercised. In the 1880s from an Albanian point of view the sanjaks of İpek, Prizren, Priştine, Üsküp and Yenipazar within Kosovo vilayet belonged to the region of Gegënia. Muslim Bosniaks whose native language was Slavic formed a sizable number of Kosovo vilayet's population and were concentrated mainly in Yenipazar sanjak that contained several prominent Bosniak landowners. Circassian refugees who came from Russia were resettled by Ottoman authorities within Kosovo vilayet in 1864, numbering some 6,000 people by the 1890s and provided the state when needed with auxiliary troops. In the northern half of Kosovo vilayet Orthodox Serbs were the largest Christian group and formed a majority within the eastern areas. Orthodox Serbs were under the ecclesiastical authority of the Ecumenical Patriarchate of Constantinople and a metropolitan, often of Greek ethnicity, lived in Priştine and presided over the affairs of the Orthodox population in the province. A seminary existed in Prizren with 100 resident seminarians with many originating from Montenegro. From the 1860s onward, Serbia pursued an active policy of supporting Serbs in Kosovo that entailed sending teachers to the vilayet, supplying subsidies to assist Serb schools and providing scholarships to study in Belgrade. Serb cultural clubs were active in major urban centres containing a sizable Serbian population with some local Serbs supporting a future incorporation of the province into a Greater Serbia. Serb schools in the province also attracted some Muslim Albanians as students. Several thousand Aromanians inhabited Kosovo vilayet. Bulgarians lived in the southern half of Kosovo vilayet. There have been a number of estimates about the ethnicity and religious affiliation of the population of the heterogeneous province. Ottoman provincial records for 1887 estimated that Albanians formed more than half of Kosovo vilayet's population concentrated in the sanjaks of İpek, Prizren and Priştine. In the sanjaks of Yenipazar, Taşlica and Üsküp, Albanians formed a smaller proportion of the population. According to Ottoman yearbooks, in 1901, the Kosovo vilayet which encompassed five sanjaks: Skopje, Priština, Prizren, Novi Pazar, and Pljevlja had 964,657 inhabitants; two thirds were Muslims and one third was Christian. The Muslims were primarily Albanians and the Christians were mostly Serbs. The yearbooks, however, are deemed unreliable sources as they, in some districts, did not register the female population, but balanced the numbers against the male population, though it is a well known fact that the number of male heads exceeded the number of female heads throughout this period not only in those lands but in Serbia Proper as well. British journalist H. Brailsford estimated in 1906 that two-thirds of the population of Kosovo was Albanian and one-third Serbian. The most populous western districts of Đakovica and Peć were said to have between 20,000 and 25,000 Albanian households, as against some 5,000 Serbian ones. A map of Alfred Stead, published in 1909, shows that similar numbers of Serbs and Albanians were living in the territory. Ethnographic map of the Balkans by the pro-Greek A. Synvet of 1877, a French professor of the Ottoman Lyceum of Constantinople. ^ "Central Mosque Of Prishtina, Architectural Design Competition Brief" (PDF). p. 18. Retrieved 8 June 2013. ^ Chisholm, Hugh, ed. (1911). "Usküb" . Encyclopædia Britannica. 27 (11th ed.). Cambridge University Press. p. 811. ^ Salname-yi Vilâyet-i Kosova ("Yearbook of the Vilayet of Kosovo"), Kosova vilâyet matbaası, Kosova [Serbia], 1318 . in the website of Hathi Trust Digital Libray. ^ Chisholm, Hugh, ed. (1911). "Kossovo" . Encyclopædia Britannica. 15 (11th ed.). Cambridge University Press. p. 916. ^ "(HIS,P) Treaty of Peace between Greece, Bulgaria, Montenegro, Serbia on the one part and Turkey on the other part. (London) May 17/30, 1913". www.zum.de. ^ "Kosova Vilayeti - Tarih ve Medeniyet". tarihvemedeniyet.org. 8 October 2009. ^ a b c d e f g h Gawrych 2006, p. 34. ^ Şimşir, Bilal N, (1968). Rumeli’den Türk göçleri. Emigrations turques des Balkans [Turkish emigrations from the Balkans]. Vol I. Belgeler-Documents. p. 737. ^ Bataković, Dušan (1992). The Kosovo Chronicles. Plato. ^ a b c d e f g h i j k Gawrych 2006, p. 35. ^ Gawrych 2006, pp. 30, 34. ^ Gawrych 2006, pp. 34-35. ^ Gawrych, George (2006). The Crescent and the Eagle: Ottoman rule, Islam and the Albanians, 1874–1913. London: IB Tauris. pp. 28-29. ISBN 9781845112875. ^ Detailbeschreibung des Sandzaks Plevlje und des Vilajets Kosovo (Mit 8 Beilagen und 10 Taffeln), Als Manuskript gedruckt, Vien 1899, 80-81. ^ H. N. Brailsford, Macedonia, Its Races and Their Future, London, 1906, p. 274:Today the Serbs are a remnant which has dwindled by emigration, massacre, and forced conversion, to the rank of a mere third of the population. ^ Servia by the Servians, Compiled and Edited by Alfred Stead, With a Map, London (William Heinemann), 1909. (Etnographical Map of Servia, Scale 1:2.750.000). ^ Robert Shannan Peckham, Map mania: nationalism and the politics of place in Greece, 1870–1922, Political Geography, 2000, p. 4: "Archived copy" (PDF). Archived from the original (PDF) on 2009-02-05. Retrieved 2010-04-02. CS1 maint: Archived copy as title (link) "Other maps by amongst others the Frenchman F. Bianconi , who was the chief architect and engineer of the Ottoman railways, A. Synvet  and Karl Sax , a former Austrian consul in Adrianople, were similarly favourable to the Greek cause." ^ "Latest intelligence - The near East". The Times (36741). London. 14 April 1902. p. 6.